Where is Kiokya’s music contract? Giving an update on the progress of the young songbird, her manager Fidel Taylor revealed that the contract only provided for a single to be made and not an entire album. He outlined that he was, however, able to negotiate to have Kiokya record her single in Jamaica instead of England. He admitted that Kiokya has already come up with 12 songs, which he said are all good, making it difficult to choose just one to record. The manager said he is negotiating to get Cruickshank to take her prize trip to Canada where she has relatives instead of England where there will be neither accommodation nor spending money. Speaking with Cruickshank, the singer said that she is anxious to get her recording done, which she hopes to do by early next month. 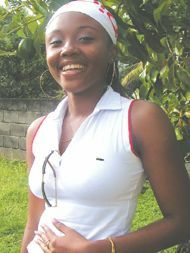 She expressed gratitude to Digicel and the Rising Star company for the prizes and exposure she received throughout the Caribbean, but expressed frustration in the set- backs because of the fine print written into her contract.